How do I register for one of your classes? All of our currently available courses can be found and registered for here. I registered for a specific date but received confirmation for a different date. How do I fix this? No problem! Go ahead and re-register for the date you are looking for by clicking on the date in order to get the drop down menu and then select the date you are looking for. The time is posted in a different time zone when I register. How do I make it my time zone? 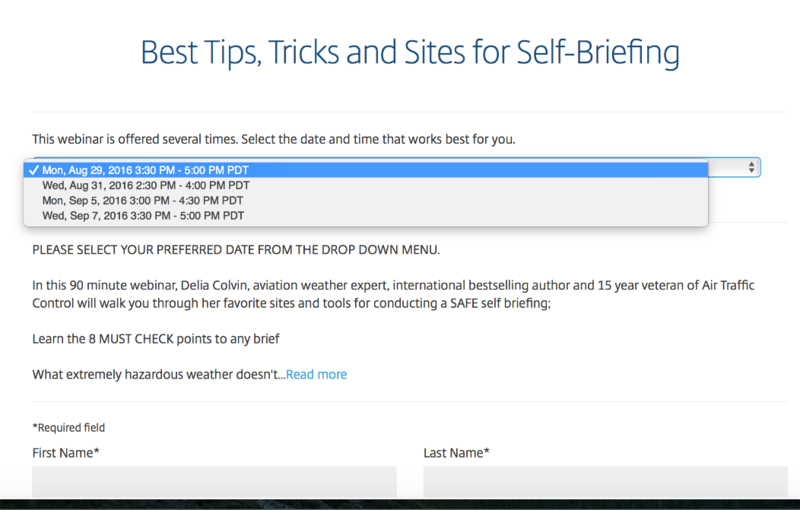 Right below the date drop down, GoToWebinar gives the option of changing the time zone. How do I log onto the webinar? You will receive a reminder email, 24 hours, 3 hours and 1 hour before the webinar. In the email, the link to get onto the call will be provided. You will find the link provided in this email. 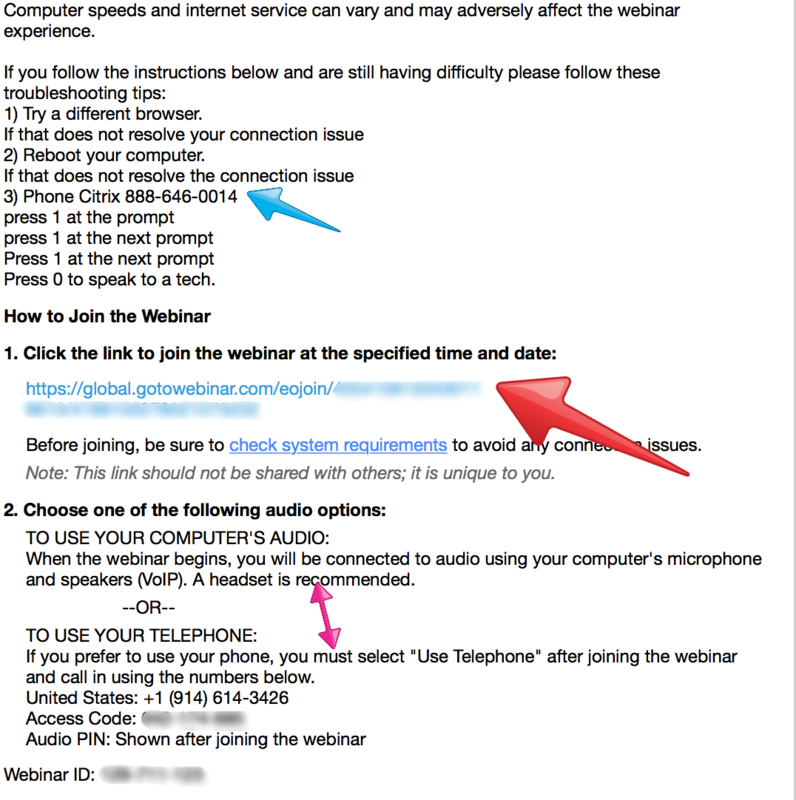 The red arrow shows where to click to be taken straight to the webinar. You will be directed to enter your name, email, pilot rating, and WINGS email before entering the call. If you continue to have problems, you can either move to step 2 and use audio to listen while you follow along with your screen. Citrix also provides their support number in case you continue to have touble. If you have the GoToWebinar app, you can also participate by entering the Webinar ID (which is located at the bottom of this image). Once I purchase the Aviation Weather Series, how often can I view the training videos? The videos are set up so that you can view them as often as you want, 24/7. We do this because we want you to have total access to this life-saving information. Videos are upgraded when new information is made available and the videos are automatically replaced. We have also provided these in a new format to allow for full screen viewing as well as tracking to allow us to give WINGS credits for your training. *Please note these videos are only for personal use and are not to be shared. Sharing can result in cancellation of your access to the videos without a refund. How do I get my WINGS credits? b) If not there, please send an email to Customer Service. On the subject line put WINGS credit. 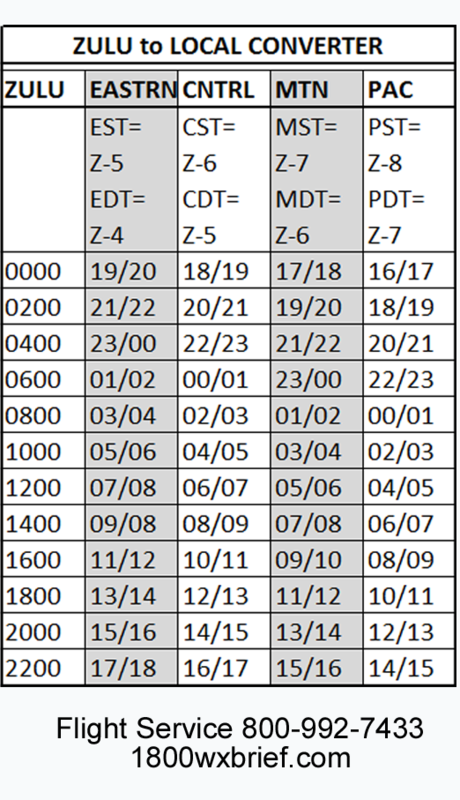 The date you attended the webinar and the FAA webinar number if you have it. This will begin with a “WP” followed by seven digits (ie WP0167779). Can I get a list of the links for the websites you talk about in your webinars and books? Aviation Abreviations. Free website for general aviation. Gain access to powerful tools for pre-flight, in-flight and post-flight.